There are Facebook users and then, there are FacebookPro Business users. What is the difference? Business! Facebook can be little more that a place to hype the life style you may or may not really be living. It may be a place to share cat, kid and toy pictures and not much more. Or, Facebook can be the key to finding new customes and converting customers into clients. The choice is certainly yours to make, but for those who want to go beyond wishing for more commissions, to those actually receiving them, there is e-Agent® InstantOn™ service. 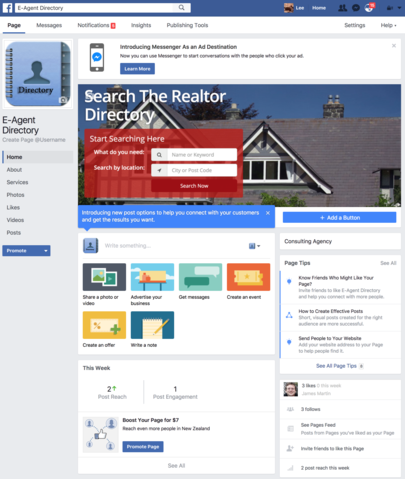 Meant to be used in conjunction with e-Agent's Advanced Facebook non-verified course, FacebookPro ensures that you will have a Facebook presence "sticky" enough to attract and hold the attention of an ever increasing client base. So what do you actually get for your $395.00? A professionally designed FacebookPro page, with a graphical "look and feel" that reflects your professional practice. An advanced Â personal/business profile. Multiple "Tabs" (pages) that can be used for in-depth service marketing, including photo-galleries for your current and sold listings. SEO (Search Engine Optimisation) which is critical to having your Pro page found. Already an e-Agent Academy graduate? Your first year of using the extremely useful Commission Calculator is FREE (a $29.95 value) on us. Continue to keep your REA accreditation up to date using our e-Agent academy each year to continue to get the use of the Commission Calculator for free. This is our way of saying thank you for being a loyal customer.